The artist describes this rose as “graceful,” and this is achieved through the use of gently curving lines. 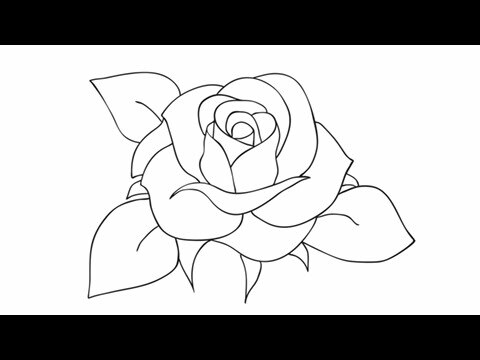 This relaxing video tutorial will guide you through the steps of outlining the rose, removing guide lines, adding detail, and shading. In the year 1461, the rose became a symbol of British royalty, and its monarchs, especially queens, were often painted holding the flower. Such famous names as Pierre-August Renoir, Paul Cezanne, and Claude Monet have included images of roses in their artwork. The earliest known painting of a rose was discovered in a fresco at Knossos, Crete, dating to around 1,500 B.C. If paints are your drawing medium of choice, this is the tutorial for you. 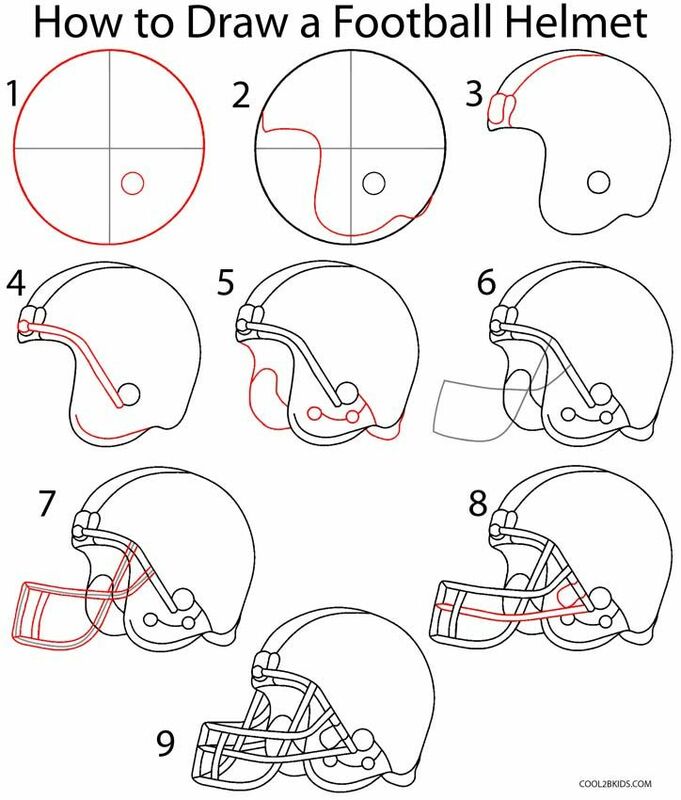 The artist employs the same simple steps presented in previous tutorials. The difference lies in the fact that he crafts his rose using paints and water colors. Get out your brushes and pallet and you can, too. When someone gives you a single rose or a bouquet of roses, you likely place them in a vase to enjoy their beauty as long as possible. 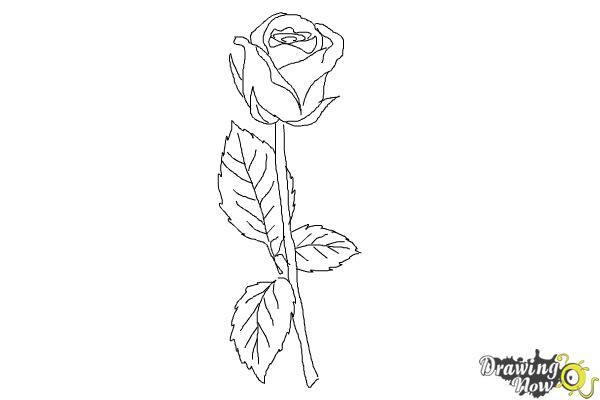 Now, you can draw a rose complete with a vase, using this easy video tutorial. In this video tutorial, you will learn how to sketch a rose quickly and easily. Notice how the artist draws the original lines very lightly. He then goes back over the lines, adding detail as he darkens and solidifies them. This step-by-step tutorial will show you how to draw a vintage style pop art rose. This rose has a banner across it that reads, “Lover,” but you can customize it with whatever message you would like. See the drawing tutorial. This video tutorial uses the same basic elements as the previous tutorial – the lowercase letters r, o, s, and e. However, rather than layering the letters at unusual angles as in the last tutorial, this guide begins by writing the word “rose” on a piece of paper. Then, additional lines are added to connect the letters, forming both a rose flower and an unopened rose bud. 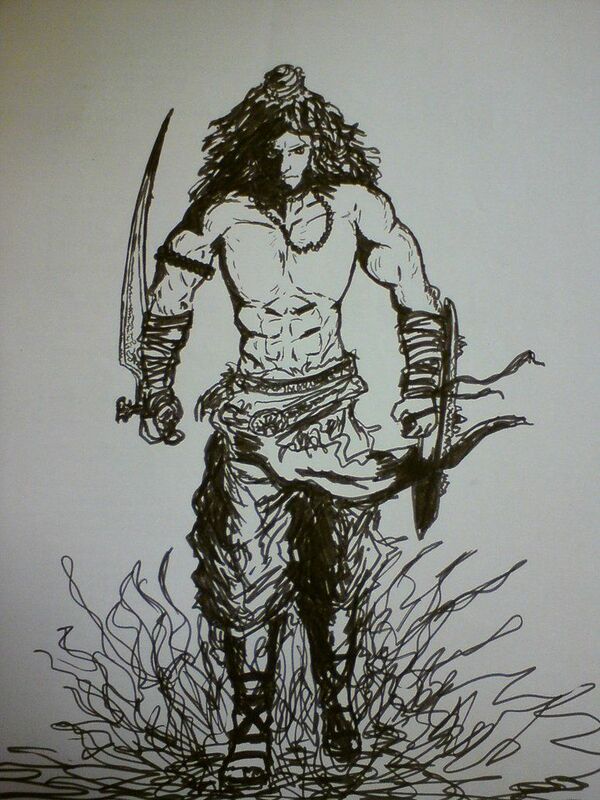 The word itself is soon hidden in the drawing. Would you like to include roses in your artwork, as have so many masters of the past? Now you can. 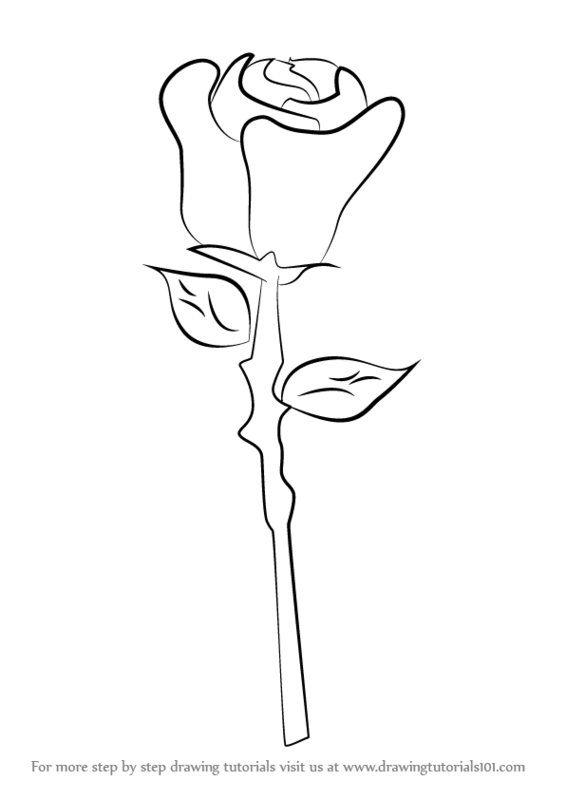 This simple rose drawing is a good starting point for beginners. It uses straightforward lines and shapes to craft the flower’s stem, leaves, and petals. This tutorial also features an informative video. See the drawing tutorial. Roses also appear in works of art dating back many centuries. They are the among the most popular subjects in classical paintings, second only to the human form. For example, the Codex Manesse, a book of German love songs dating to around 1305 A.D., includes red roses in its illustrations. This tutorial depicts a tree style rose with two blossoms. The drawing can be completed in only five steps. See the drawing tutorial. This tutorial is exceptionally inventive in the lines chosen to form the rose. In each of the first four steps the lowercase letters r, o, s, and e are used to draw different parts of the flower. By the time the drawing is completed, the letters are hidden in the form. See the drawing tutorial. 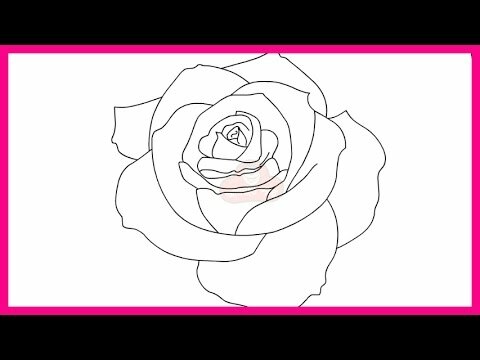 In this brief – and positively adorable – video tutorial, a very young artist demonstrates her unique style of drawing a simplified rose. The form uses shapes such as an oval divided by the stem to form two leaves. 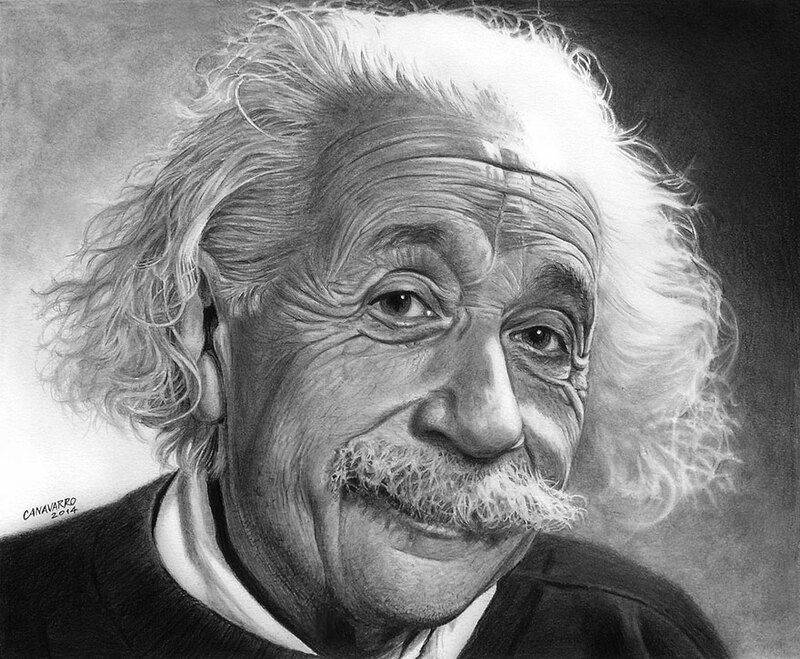 This tutorial is proof that even the very young can master the art of drawing. Cut flowers, including roses, eventually wilt and die. Just such a rose is depicted in this step-by-step tutorial. A wilted rose can also be used to represent unrequited love. See the drawing tutorial. 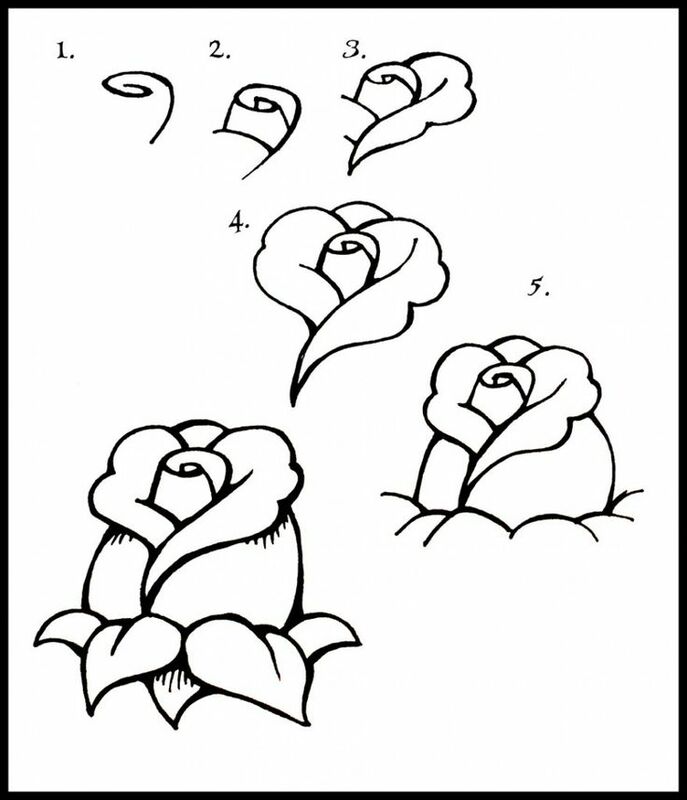 Most of the previous tutorials have included videos of an artist drawing a rose by hand. If you find those appendages distracting, you will enjoy this hands-free, computer generated rose drawing tutorial presented in real time. Follow along in adding lines to your own drawing, whether by hand or using a computer drawing program such as Paint. This tutorial was designed for budding artists of all ages. It employs simple lines, beginning with the letter y, and requires no erasing of lines. We’ve compiled the best easy rose drawing tutorials from across the internet. With fifty tutorials to choose from, you are sure to find the perfect rose to fit your needs. Some tutorials are designed specifically for greeting cards, featuring a banner on which to write. Many are very simple, while a few capture the natural beauty of this flower in great detail. In this video tutorial designed specifically with children in mind, you will learn how to draw yet another rose. The artist begins with a spiral shape and adds simple lines to form the flower. Even the youngest of artists can master this project. Once you’ve mastered the easy drawing tutorials listed above, would you like to try your hand at drawing a more detailed flower? In this easy video tutorial, the artist begins with simple lines and shapes, as in the other tutorials. 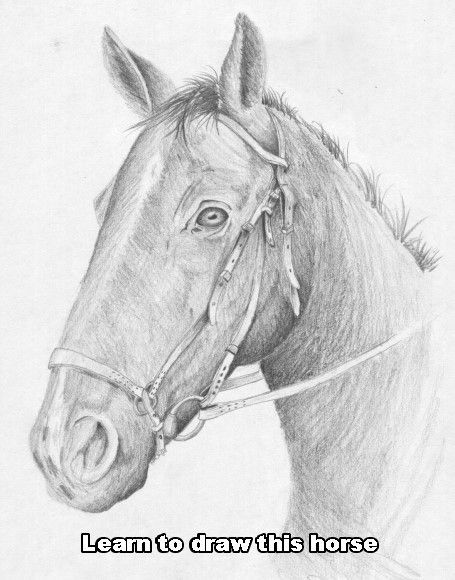 Once the outline is completed, the artist demonstrates a simple shading technique that will add realism to your drawing. The tribal art style is a popular feature of clothing, items such as school supplies, and body art. 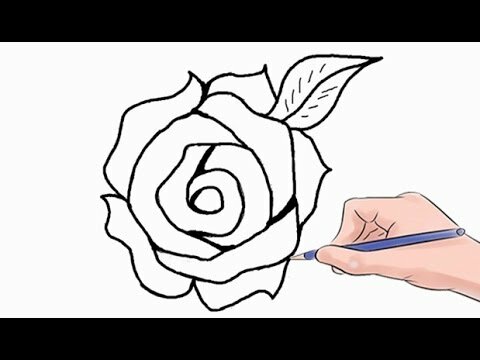 With this simple video tutorial, you will learn to draw a rose in this unique style. 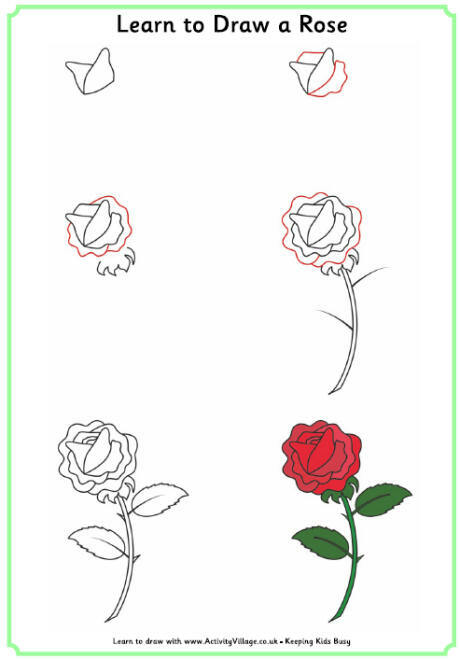 In this tutorial, you will learn how to draw a rose starting with a square crossed by a number of straight lines. You will use these lines as guides as you draw the flower. See the drawing tutorial. Take your rose drawing skills to the next level by adding a fine feathered companion. Hummingbirds are known for visiting flowers in search of the nectar on which they feed. Draw this beautiful hummingbird visiting a rose blossom using this easy tutorial. See the drawing tutorial. Why draw just one rose when you can draw many? This “speed doodle” video tutorial will teach you how to draw a complete bouquet of simple spiral roses, quickly and easily. This video tutorial demonstrates both how to draw a simple rose using curved lines, and how you may shade the flower using colored pencils. The artist chooses purple for the rose in the video – what color will yours be? Similar to the “Simple Rose” tutorial, this tutorial breaks down drawing a single rose into a series of overlapping shapes. Notice that in each step, new lines added are shown in red. See the drawing tutorial. Roses of different colors are given to others to indicate different sentiments. For example, red roses indicate love and romance; white roses, purity and innocence. Dark pink roses are a symbol of gratitude; light pink are given in sympathy for a loss. Yellow roses mean friendship. Orange, coral, or salmon colored roses symbolize desire. Purple roses are used to celebrate love at first sight, and red and white roses, when given together, symbolize unity. In this video, watch the artist’s hand as he slowly draws a simple rose. The lines and shapes used are described in text at the bottom of the video screen. The artist even hesitates to let you catch up between steps, but feel free to pause the video if you need more time. This blocky rose is drawn using straight lines and various angles. The effect is a unique and lovely take on the flower. See the drawing tutorial. Most of the tutorials contain step-by-step illustrations with written instructions, and many also feature how-to videos. 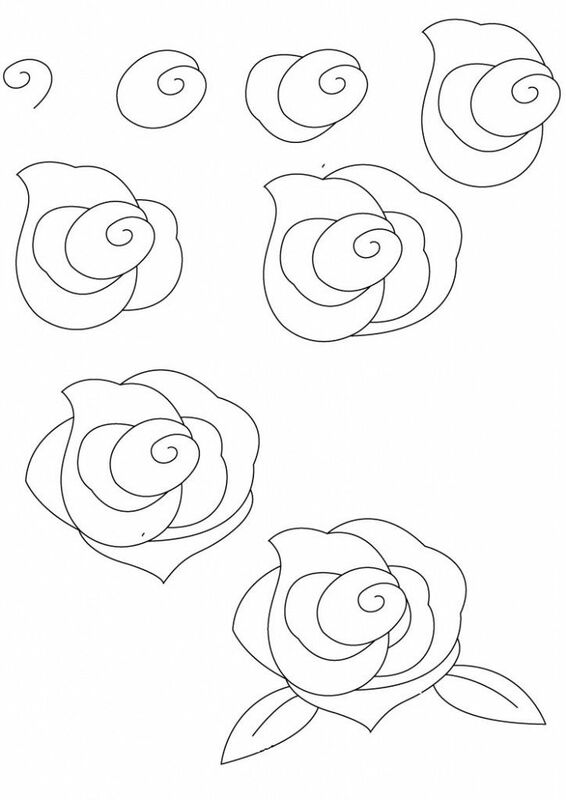 This simple rose drawing tutorial comes with both a step-by-step and video format. See the drawing tutorial. 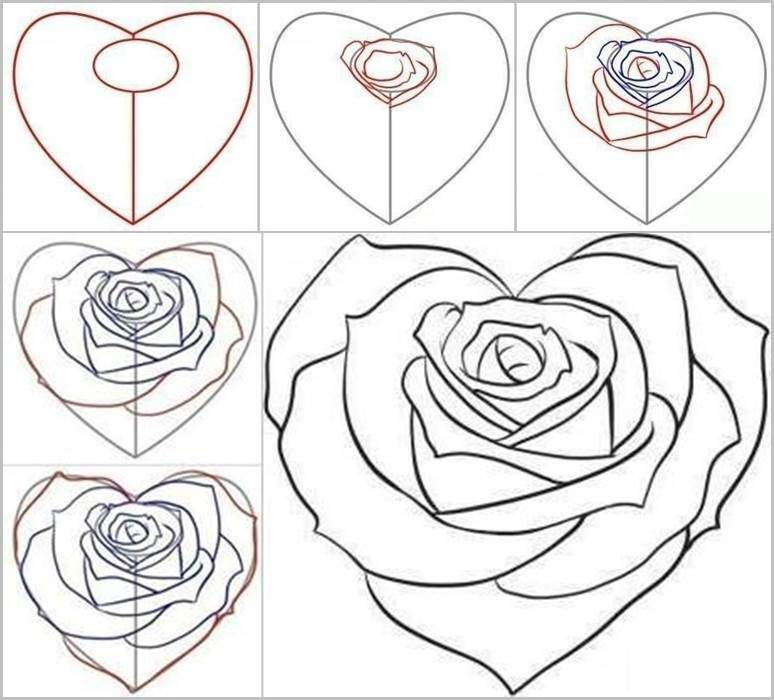 In this tutorial, you will learn how to combine a number of simple roses, twisting their stems into the shape of a heart. This tutorial combines an easy to draw rose with a banner that reads “LOVE.” This rose can become a perfect gift for the one you love. Roses and hearts are two symbols often associated with love. The two are combined into one drawing in this tutorial, in which the rose blossom itself is in the shape of a heart. See the drawing tutorial. Did you know you can draw a beautiful flower using only squiggly lines? This step-by-step guide will show you how. Each new layer of lines is shown in a different bright color. See the drawing tutorial. Rose petals are often used to decorate at weddings and similar events. 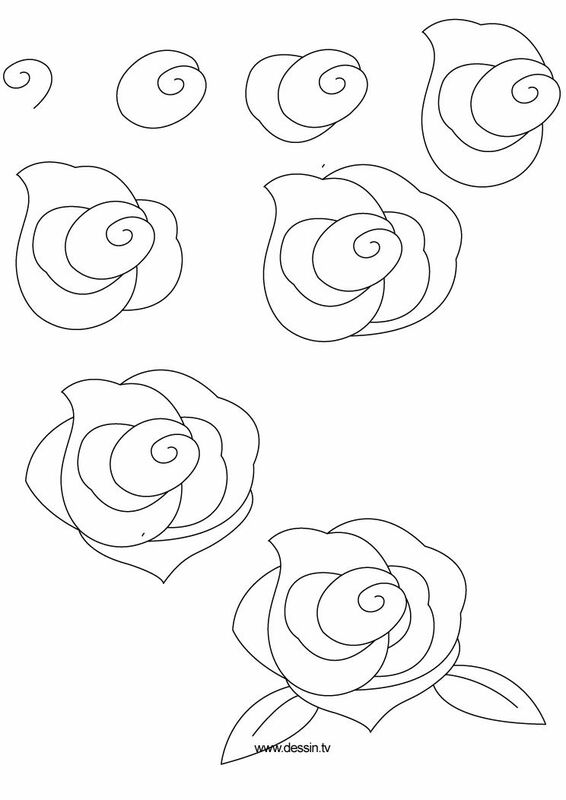 Use this simple tutorial to draw your own rose petals. See the drawing tutorial. Let your creativity bloom with one of the following step-by-step, simple drawing guides. Before a rose flower opens, the cluster of petals is known as a rose bud. You will learn how to draw a rose bud in this easy video tutorial, while learning rose vocabulary and facts along the way. For example, did you know that the small green leaves around the flower are called sepals? Or that rose hips – the bulbous portion of stem just below the flower – are edible? 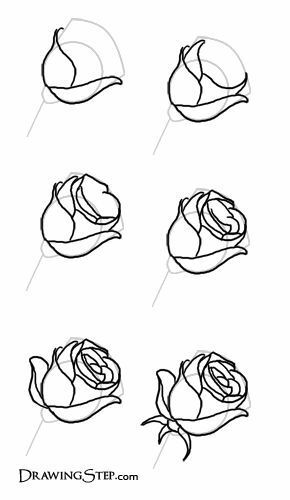 Giving someone a bouquet of seven roses is said to mean “I’m infatuated with you.” Now, you can draw just such a bouquet using this step-by-step guide. Note that newly drawn lines are shown in red, previous lines in blue, and guide lines in light grey. See the drawing tutorial. This simple rose drawing tutorial takes the unique approach of using circles. Your drawing will start out within a large, circular guide line, and the petals are drawn as circles before the detail is added. See the drawing tutorial. You’ve probably noticed that rose blossoms can take various forms, from tightly closed buds to wide open, expansive flowers. This easy video tutorial focuses on the rose in full bloom, its wide open form. This artist begins by sketching simple shapes with a pencil, focusing on the folds of the petals. Later, the lines are retraced using a black pen, and the guide lines (in pencil) are smudged to detail the petals. In this tutorial, the artist not only shows you how to draw a rose, but she talks you through the process as well. 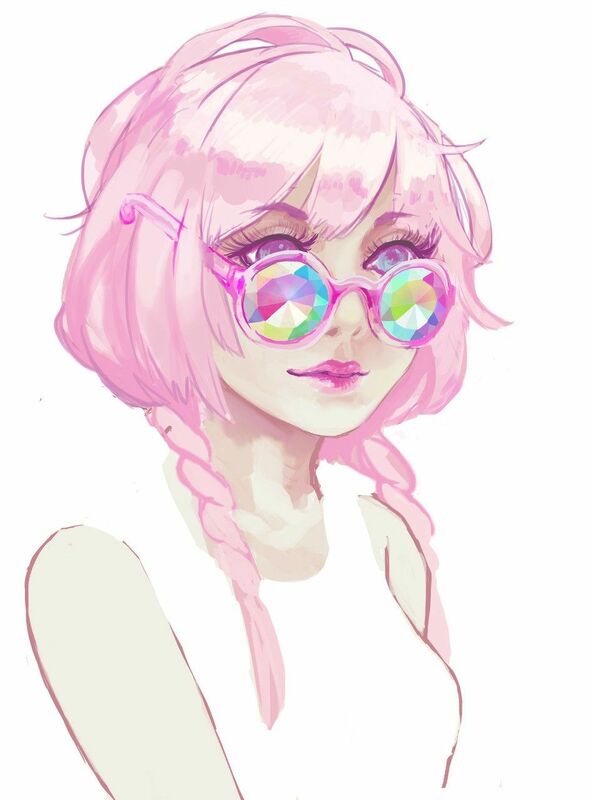 This tutorial is shown at a pace to allow you to draw along with the artist. Once the drawing is completed, the artist will show you how to shade, or color, the rose in a realistic fashion. Watch the side of the screen for interesting rose facts and quotes about roses as well. Flowers don’t have to be realistic – they can be cute characters with personality, too! This video tutorial will teach you to draw a rose in Japanese kawaii style – capturing the adorable anime qualities endowed by big, watery eyes. This tutorial depicts the thorny vine of a rose wound tightly around a heart. Does the rose indicate love that’s captured someone’s heart? That’s up to you to decide. Notice that in each step, new lines are shown in red, while previously drawn lines fade to blue. See the drawing tutorial. In many societies throughout history, roses have held a cultural significance. Giving a bouquet of roses often indicates romantic interest in the recipient. In this video tutorial, watch the author’s hands as he crafts a rose, one petal at a time. This tutorial provides more detail than those listed previously, and is therefore an excellent way to enhance your rose drawing skills. The shape of the petals, as well as the shading, demonstrated in this tutorial provides the flower with an increased sense of depth and dimension. Roses are familiar flowers throughout the world. They are known for their layered petals, fragrant smell, variety of colors, and sharp thorns along the stem. There are hundreds of species of this plant, and thousands of cultivars, or breeds, developed by horticulturalists. Wild varieties are native to almost every temperate continent, including Asia, North America, and Europe. This tutorial takes a unique perspective on teaching kids to draw. In addition to the adult instructor, the video features a child following the steps in real time. If he can draw a rose so easily, so can you! As markers are the drawing medium used, no erasing is required. Roses are grown for their beauty, as well as for use in perfumes, as a flavoring in food and drink, and in medicines. In the country of Turkey, rose flavored candy is a popular treat. All you need to draw a rose is a pencil and a piece of paper. You will also want to have an eraser handy to correct any mistakes and to remove guide lines – those lines made early on in a drawing that must be removed prior to completion. Since roses are known for their vibrant colors, acquiring paints, colored pencils, crayons, or markers is also helpful. This computer generated video tutorial was designed for kids of all ages – including the grown-up ones. This guide uses simple lines to form the flower. The video is paced so that you can easily follow along with your own drawing. In this video tutorial, you will begin your rose using the shape of a cylinder. Then, the artist will walk you through, step-by-step, how to add petals and other details to the original cylindrical shape. You will also learn a number of different styles for drawing petals. Viewed from the side, roses and lotus blooms are almost identical. Omit the lily pad from this simple drawing tutorial to create a beautifully stylized side view of a rose flower. See the drawing tutorial. This step-by-step tutorial tackles the task of drawing a rose from three different perspectives. The first begins with a small freehand circle, the second with a spiral shape. In each, petals are added around the initial shape. The final guide involves a rose with a stem. See the drawing tutorial. In this simple, step-by-step tutorial, you will draw a wacky rose with big eyes and a charming smile. See the drawing tutorial. This tutorial will help you to draw the bloom of the rose in a frontal, portrait type view, omitting the stem and focusing on the beauty of the flower itself. In addition to step-by-step instructions, this tutorial also includes a video. See the drawing tutorial. Roses have also found their place amid popular culture. For example, a rose protected in a glass case featured prominently in the plot of Disney’s Beauty and the Beast (1991, 2017). Roses are still popular adornments on clothing and jewelry, accessories, and home decorations. Weddings, wedding anniversaries, first dates, school dances, and Valentine’s Day are among the contemporary celebrations in which roses are commonly exchanged. 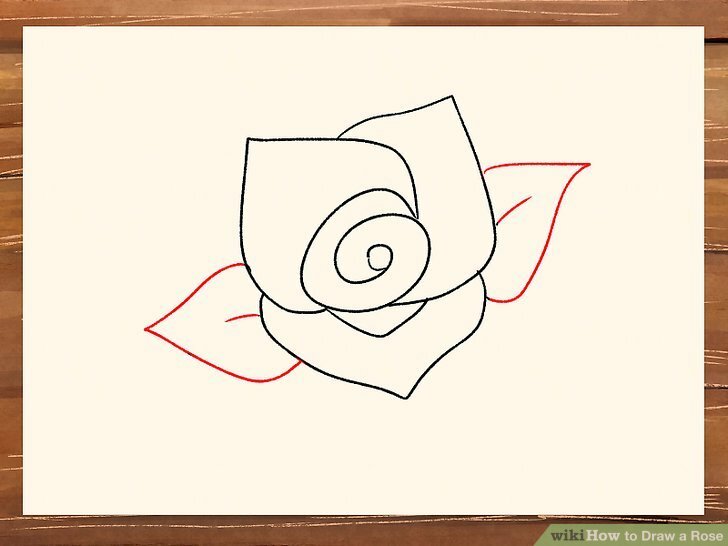 In this drawing tutorial, you will be able to combine your rose drawing skills with a heart and a banner. This project makes a great card when you add words such as “I Love You,” “I’m Sorry,” or “Get Well Soon” to the banner. It was a tale as old as time. The rose, left by a beautiful enchantress, was meant to remind the Beast of his selfishness and cruelty. In order to break the spell and become fully human once more, he had to learn how to love before the flower’s last petal fell. You can draw the enchanted rose using this video tutorial.